Works1 - "The Magnificent Nature"
Works2 - "Echo of the Wild Nature"
Works3 - "Fate of Wild Nature"
Works4 - "Deep Down in the Eyes"
every month from 6:30 - 8:30 PM. With something for everyone, from beginners to those with experience in the arts, this class includes instruction on traditional techniques, as well as theoretical concepts. On March 11, 2011 the earthquake and tsunami took the lives of many people, and destroyed towns. This event, on top of my memories of traveling through Asia and the Middle East, caused me to re-evaluate my thoughts on the relationship between people and nature. The towns in the Middle East which I had visited as a student were covered in the rubble from the repeated conflicts, and in regions of Asia there were many people suffering due to discrimination or poverty. Even now, the suffering of the people living in these places continues. Despite facing issues such as natural disasters and global warming, these conflicts between people still continue, and I believe the underlying reason for it is apathy and a lack of understanding towards both people and nature. I have made the dignity of humanity and reverence for nature that are being neglected as the theme of my work. 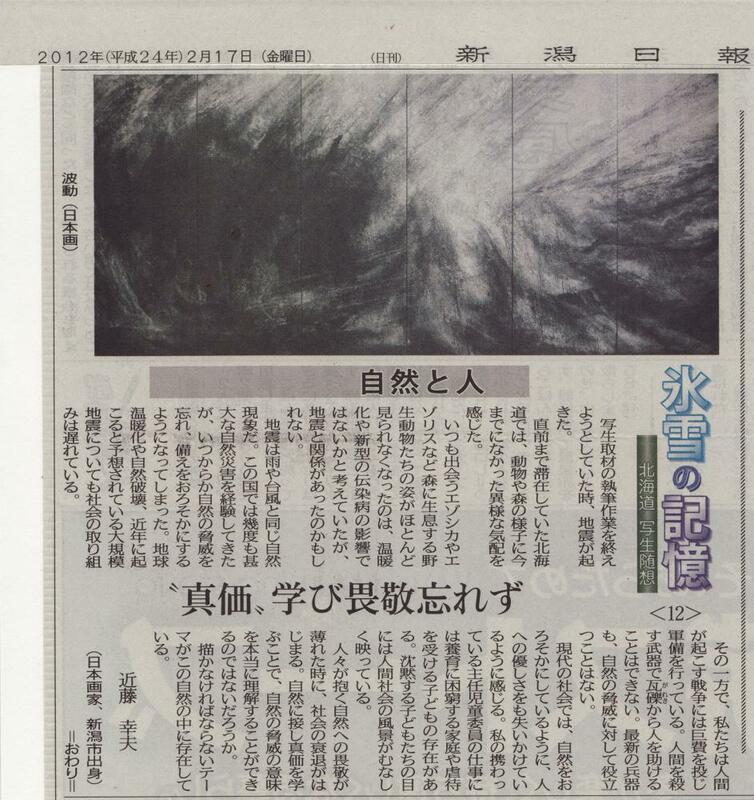 Misao Yokoyama, who, with passion for art and grand ideals, worked to create a new path for Nihonga. Matazo Kayama, who worked to refine Nihonga by combining traditional techniques with new methods of expression. When World War II came to a close, many traditionally held values began to change, and there was talk of an "end to Nihonga." In this environment, these two artists raced bravely ahead of the times, working to create a new style of art. 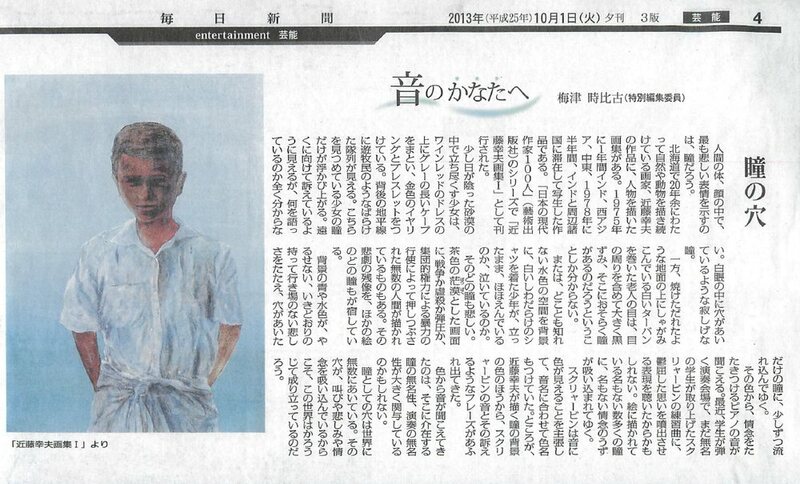 While working on their own art, they also worked passionately teaching Nihonga at Tama Art University. 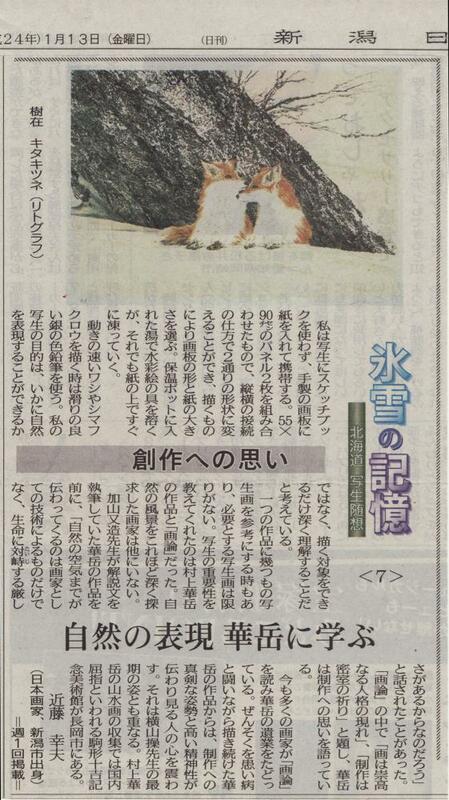 However, before their work there could come to a close, Yokoyama passed away from illness. The grief of Mr. Kayama and my fellow students is a scene which will forever remain burned into my memory. Shinichi Mashita, who was president of the school at the time, explained to us grieving students that scholarship and art existed not only for the pursuit of truth, but also as realms full of infinite possibility. He was an exceptional philosopher who stuck to his peaceful beliefs during the war, despite oppression from the government. Today, the words "The Quest for Truth" are engraved on his headstone. Misao went to war when he turned 20 and was interned just as the war was coming to an end. He worked at mining coals until he was repatriated in 1950. After returning home, he created many large works, some boiling over with his ardour and fury at fate, others filled with sadness. He was working hard on both his own art and teaching at the university when he was hit suddenly by a stroke and the right side of his body became paralyzed. However, through his own toughness and sheer force of will he was able to make a miraculous recovery and began painting again, switching his brush to his left hand. For the three years before he passed away he created landscapes so transparent they seemed as if they would fade away from this world. When Misao Yokoyama passed away, Matazao Kayama seemed almost as if he were crying out to the heavens when he wrote "What will become of Nihonga now?" Matazao's early paintings combined compositions inspired by the paintings of Pieter Brueghel the Elder, and traditional Japanese forms he recreated, such as folding screens in the style of the Rimpa School. He was an artist who defied categorization by working in a wide variety of genres; he created ink wash paintings, prints, pottery, and even kimono designs. He threw himself into his work, and at times when he gazed into the distance it seemed almost as though he were looking to Misao Yokoyama. In his final years he was awarded an Order of Cultural Merit, the highest prize in the Japanese arts. A large tile work he created is currently hanging in Narita Airport, and shows the beauty of the Japanese arts to people arriving from around the world. The word "Nihonga" was first coined in Japan in the early years of the Meiji era in order to describe Japanese-style painting in relation to Western painting. Painting in the convention of works such as the Kitora Tomb, the Takamatsuzuka Tomb, and the main hall of Horyu-ji had already been practiced for 1,300 years before this naming. The materials and style of painting at that time were highly influenced by the culture of the Chinese continent, the countries of the Korean Peninsula, and others. However, over time these materials and the aims of artists changed, molded by an aesthetic sense which was highly influenced by Japan's natural landscape. From picture scrolls painted for record keeping, to paintings on folding screens and sliding partitions which were painted as decorations, even to picture scrolls intended to express spirituality, Nihonga influenced, and was influenced by other traditional arts such as calligraphy and ceramics. From this was cultivated a distinctly Japanese culture of art. Even today, the materials and style of Nihonga may vary depending on the season, the event for which it is created, or the place in which it will be displayed. It seems to exist in a place where a person's daily life and aesthetic sense meet. Behind the exceptional materials used in Nihonga are the crafts-people who support the culture of art in Japan. Their careful technique, and their way of thinking (which has been influenced by Japan's topography and nature), can be found in each brush and in every sheet of paper. The washi used in Nihonga is created by grating up plants, and then making the paper by hand, resulting in paper made of especially long fibers. Washi is known for being difficult to tear, and for being resilient to abrasion and other wear. There are also other specialized types of washi, such as Akashi-gami, which is used when applying gold, silver, or platinum leaf to a painting, and urauchi-shi, which is used for backing paintings to make them stronger. Nihonga paints include ultramarine and lapis-lazuli, and other natural stones which are crushed into powder to make paint, white gofun paint which is made from shells, sumi ink, gold leaf, and others. When a stone is ground to create iwa-enogu (mineral paint), the particles are separated into 16 different groups based on size, allowing the artist to select their paints based not only on color, but also on the size of the particles, the way it reflects light, and even the chemical changes which can be induced. Nikawa is a collagen adhesive created from the skin of animals such as rabbits, deer, and cows. It has various uses; as an adhesive for paints, for preventing gold leaf from tarnishing, and even for creating a base for painting when mixed with gofun. There is a traditional technique which allows the artist to create fine detail, as far as painting the pores on a woman's face, by utilizing the way in which gofun and nikawa harden together. The hair used to make brushes varies depending on the animal it was taken from, and on where it is harvested. These hairs are put together one-by-one by hand to create the brushes used by Nihonga artists. The way the materials expand when exposed to water, the elasticity of the wood, and other natural properties of the materials are carefully considered to create brushes which won't easily shed hairs, and are highly durable. It's said the Nihonga brushes can be used for longer than the lifespan of their owners. While Nihonga utilizes traditional artistic techniques, it is also based in a unique expression of aesthetic sense. It is thought that the goal of Nihonga is less about creating a visual affect, and has instead been more about the sensitivities of Japanese people who look to discover spirituality in the paintings. It is also referred to as the beauty of empty space, represented by leaving, for example, an empty space in the middle of the canvas or a blank space in the background that feels as if it has some meaning. In addition, and artists may create a composition which seems to suggest space outside of the visible frame. This concept is similar to that of "reading between the lines" in a novel or essay. An unfinished piece allows the viewer to envision what it will look like upon completion. In addition, the last piece an artist paints before he/she passes away can, in its unfinished state, call to mind that artist, and function as an echo of his/her life. One might say that it is like the beauty of white space, but in relation to time. This is the name of a book written by Sukemasa Irie, an accomplished essayist who was the grand chamberlain of Showa Emperor. The "beauty which oozes from the unexpected" which he mentions in a passage of the book, is something which I believe can apply to other areas besides the arts, and provoke a deep sense of understanding. This ability to find beauty in the shapes and textures produced by natural phenomenon is the result of an aesthetic sense which has been born of a society shaped by nature. Studied at the New York University and returned to Japan in 1983. 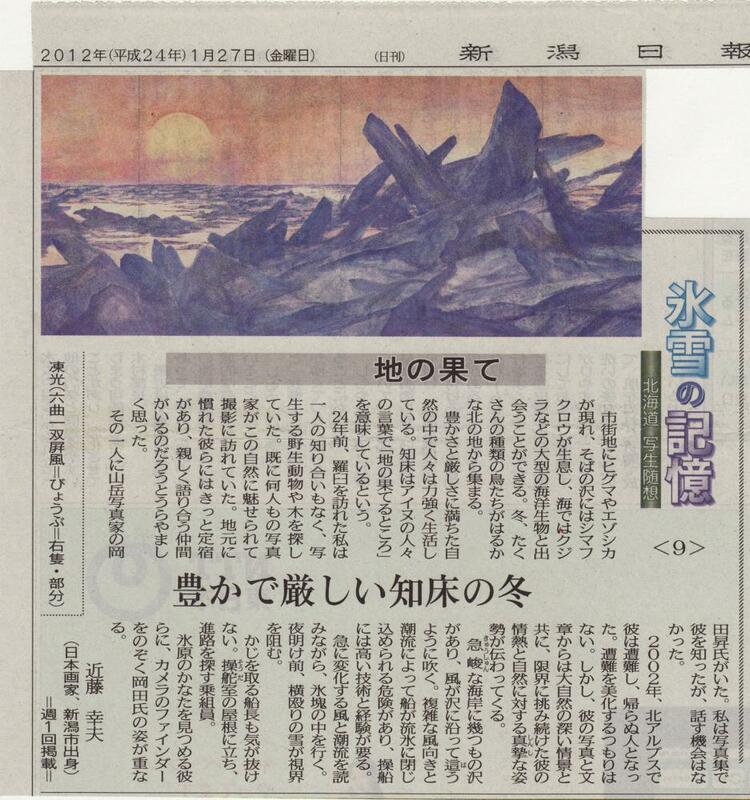 A painting titled “Glow of Nature” was selected to be included in the complete art collection book, “Sengo Nihon Bijutsu Soushuu Ⅲ(Postwar Japanese Art CollectionⅢ) published by Reijinsha Co., Ltd. 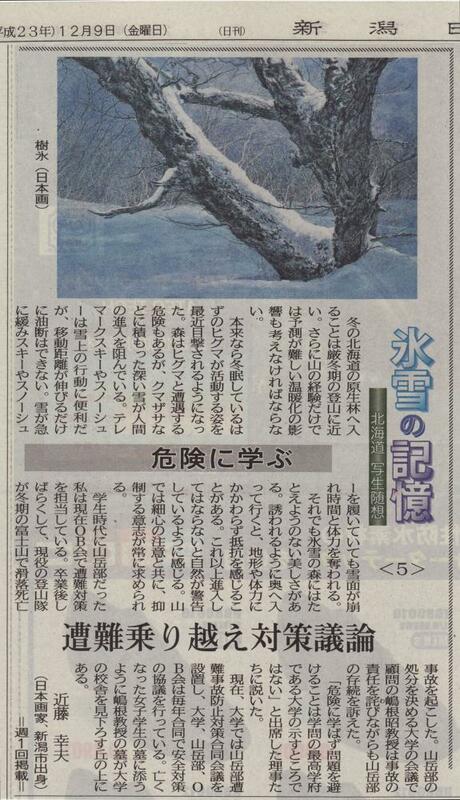 Newspaper column series "Memories of Ice and Snow"
"Memories of Ice and Snow" was an essay serialized in the Daily Niigata Nippo from November 11th 2011 until February 17th, 2012. 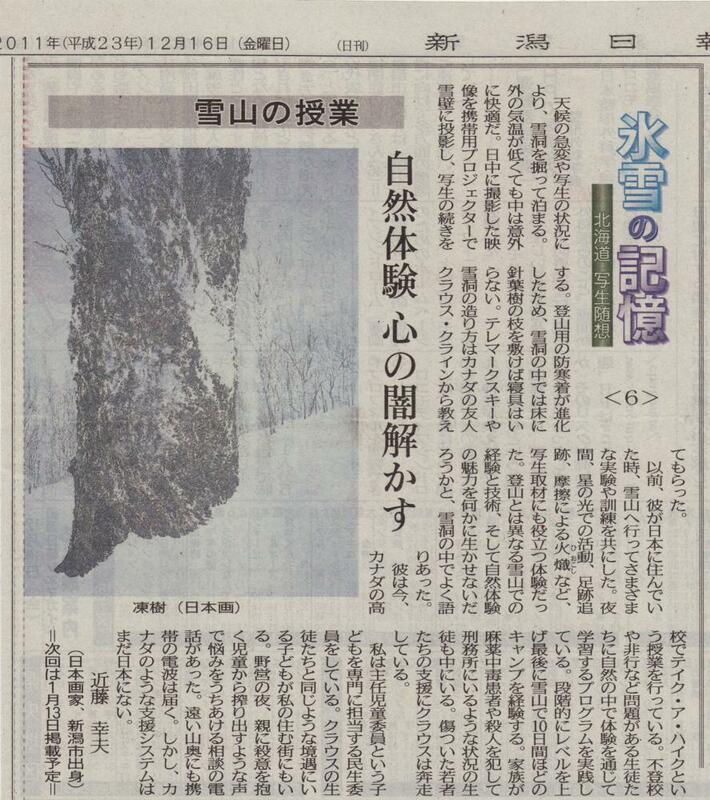 The essay focused on his thoughts on the connection between humans and nature, gathered from 24 years of visiting the harsh winter landscape of Hokkaido for his work, as well as his thoughts regarding his own work. 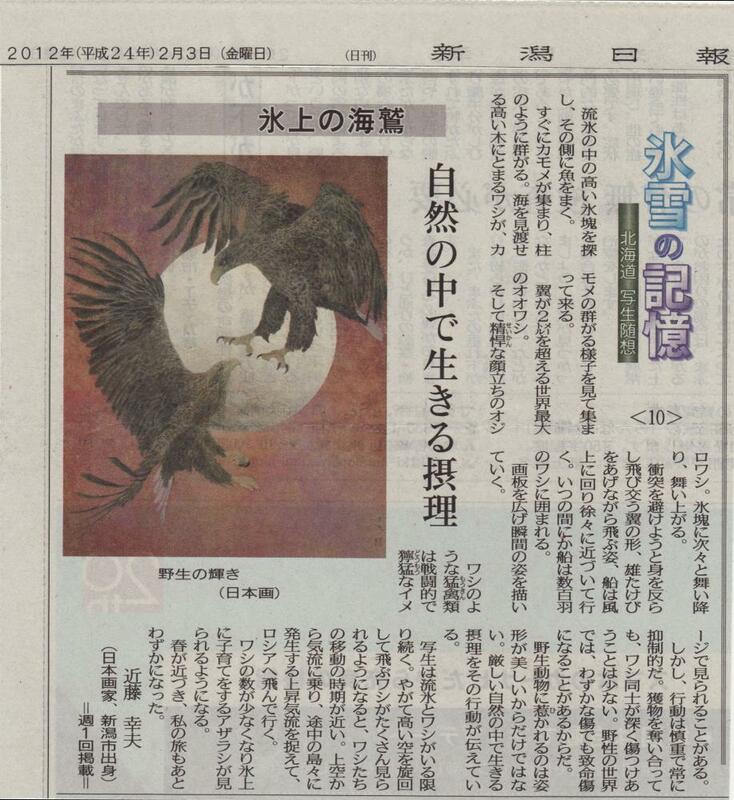 An account of the road to becoming a Nihonga artist. 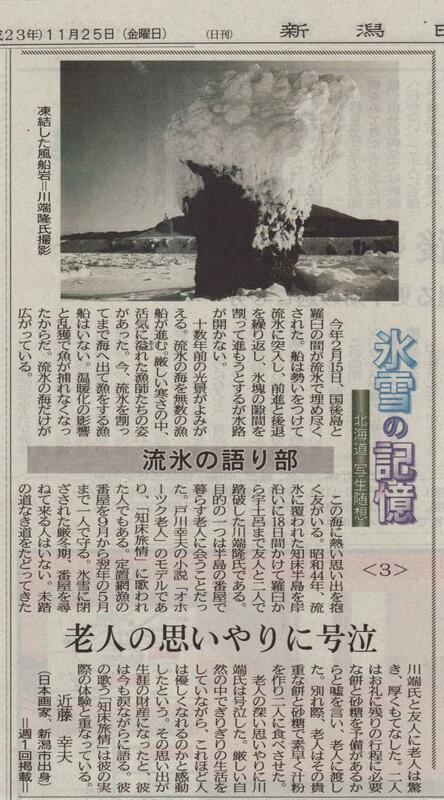 Talks of his first meeting with Matazo Kayama and the last days of Misao Yokoyama. 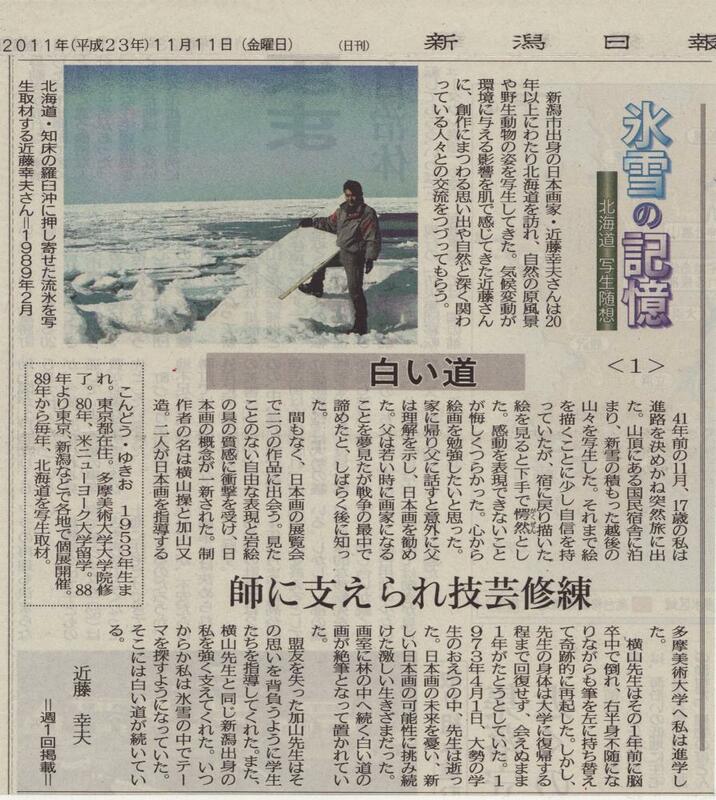 Friends held together by drifting ice, and the upbringing of captain Hiroyuki Kobayashi. 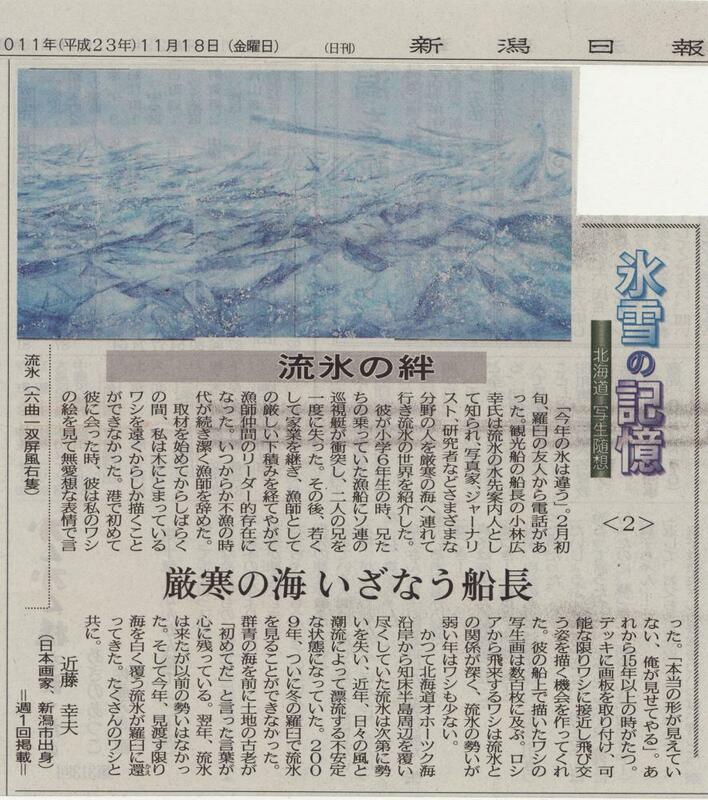 Reflecting on the journey of Takashi Kawabata, who traversed the drift-ice-covered Shiretoko Peninsula on foot. Could it be that the reason we no longer see wild animals is due to global warming or the destruction of habitats? Global warming is making climbing mountains in the winter more dangerous than ever. The lessons taught by an accident. To learn from, and be saved by nature. Klaus Klein's challenge. Lessons taught by Kagaku Murakami's "Theory of Painting." Drawing the spotted owl. Thoughts on the snow in Siberia. The beauty of Shiretoko, the "end of the earth." Nature both harsh and bountiful. 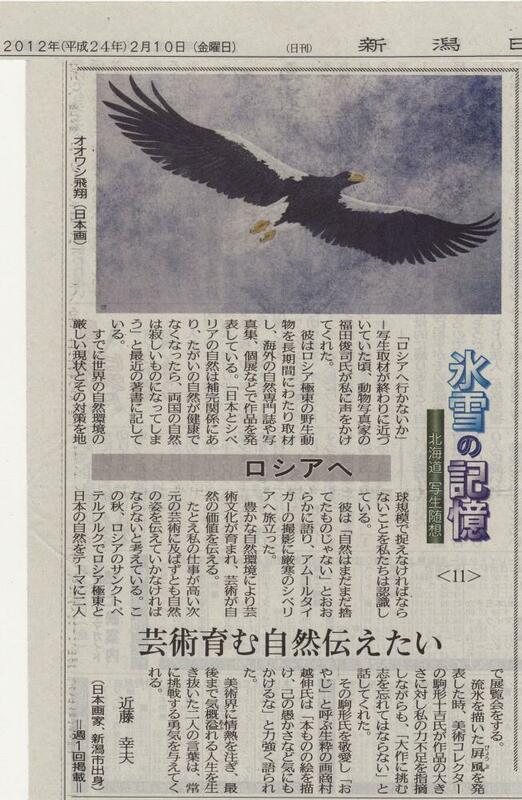 Drawing Eagles. Learning the rules of wilderness and the laws of nature. 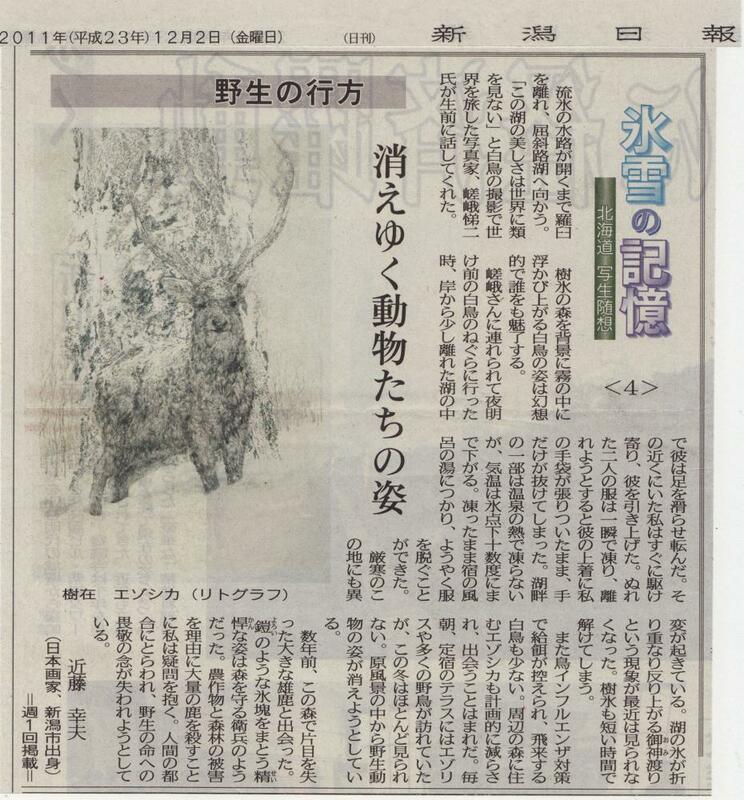 Passing on an understanding of natural conservation, and of the ways in which nature shapes art. 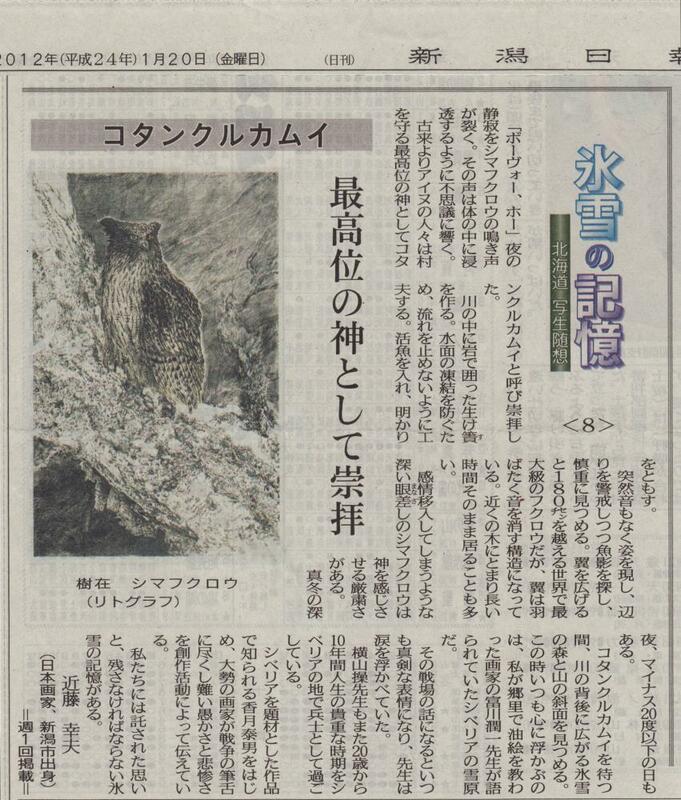 Thoughts on human dignity and reverence for nature after the earthquake. Please contact via the following channels for inquiries regarding planning or participation in exhibitions, purchasing works, speaking events, media exposure, etc. Please be aware that it may take some time to reply to inquiries from overseas. © 2013- yukio-kondo.com all rights reserved.